I was surprised how affected I was upon second viewing of Invictus. It’s a testament to Clint Eastwood’s skills are director to not complicate a good story. In most of Eastwood films, he seems to aspire to the old adage, ‘a good story well told’. Invictus happens to be a GREAT story well told. In keeping with Eastwood’s easygoing filmmaking attitude, in Invictus keeps his storytelling his conflicts are simple - the period of turmoil right after Nelson Mandela was freed and subsequently was elected as the President of the country. Though Apartheid was gone, the racial divide was still there due to the ingrained attitudes, and in many cases, hatred, of the other side. Of all things, the sport of rugby becomes the symbol of this divide. For the whites, it’s an old boys game, a guts and glory game of strength and stamina and cultural pride. For the blacks, it’s the opposite, by the mere fact that the South African rugby team (nicknamed the Springboks) instils so much pride for the whites, the blacks always cheer for them too lose. 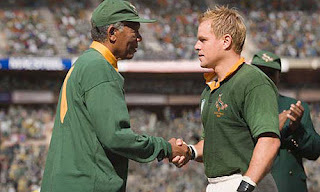 Ever the astute politician, Mandela finds this contradiction an opportunity and through a new friendship with the Springbok captain François Pienaar (Matt Damon), to bring his country together. It's inspirational cinema 101 - as my colleague Greg Klymkiw calls it, a 'meat and potatoes' story. But if you were doing a checklist of screenwriting fundamentals, you might find Invictus deficient in some of the 'essentials'. While the overall political conflict of race provides the contextual background, there’s very little intracharacter conflict pushing the story forward, and lack of a traditional 'antagonist'. Certainly this is something screenwriting guru Robert McKee would not approve of and anyone less confident and experienced than Eastwood would likely have shoehorned in another character, a tangible rival for Mandela, to beat. And herein we see the genius of Eastwood who knows when to bend the rules and in this case allow the gravitas of the real life story to surmount any of this kind of superficial conflict. Eastwood also has the thrilling rugby matches to provide us with more than enough cinematic sports action and dramatic stakes. Eastwood’s attention to detail in directing these stunning matches is miraculous. Using old fashioned techniques and modern computer graphics Eastwood renders his rugby with complete authenticity. If anything, Eastwood might linger over his panoramic shots of the spectacle once too often, but we can easily forgive a moment or two of cinematic immodesty from Mr. Humble. Morgan Freeman’s performance as Mandela is remarkable and wholly deserving of its acclaim. From the moment we see him appear on screen, walk and talk we believe he is Mandela. There wouldn’t appear to be much to do other than mimic his speech, his walking gate and other specific mannerisms. Freeman gets all these details right, but most importantly he inhabits the internal strength and confidence of the man with great subtlety. Matt Damon is the perfect match for Freeman, bulking up admirably to play a tough rugby player. His accent is on the mark and even his rugby skills look World Cup worthy. The icing on the top of Invictus and the element which makes the film sore into the upper strata inspirational cinema is Eastwood's music. This time it's his son Kyle and frequent collaborate Michael Stevens doing all the work, but their simple melodies still retains the familiar tone of elegant melancholy of Eastwood’s Million Dollar Baby, or Gran Torino scores. And the native South African choral music harmonizes perfectly with this. And shame on the Academy for not giving a nod to the magnificent final theme song 9000 days which takes us out of the film and into the picture credits. Though the collective opinion of audiences and critics seemed to be indifference, in time we should come to see Invictus as one of Eastwood’s best films, because it is.